Newly translated out of the Originall Tongues: and with the former Translations diligently compared and revised by his Maiesties speciall Commandement. Appointed to be read in Churches. Seller's Description: Folio (410 × 260 mm), 752 leaves, complete. Recased in contemporary dark calf, spine gilt in compartments, later red morocco label to style. Contemporary manuscript notes and pen trials, including the name William Toutt in a Jacobean court hand and "Ashchurche Booke" on A3r. Some small holes, tears, and abrasions, spotting and browning, nevertheless a good copy, with generous margins. Text in double columns, black letter, letterpress divisional title within elaborate woodcut borders, woodcut initial capitals, vignettes, folding map. Second folio edition of the King James Bible, with the reading " and she went into the citie" at Ruth 3:15 – hence the "She" Bible. This edition has the error of "Judas" for "Jesus" at Matthew 26:36, which is here corrected by a pasted slip. 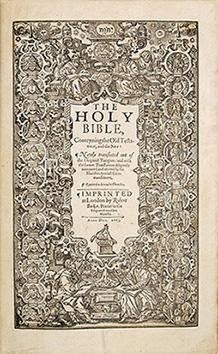 It is believed that most of this edition was printed in 1611, but publication was delayed until 1613 (the latter date being most commonly found on the title page). The King James Bible is often described as the greatest literary work created by a committee. The work was divided between 50 or so scholars divided into six groups, two each at Westminster, Cambridge, and Oxford respectively. The companies seem to have been intentionally composed of men not only with diverse qualifications but also of varying religious convictions. To help with the work of revision, 40 unbound copies of the Bishops' Bible, which was used as the foundation text, were supplied to the group, at a cost of £1 16s. 8d. each. The stately rhythms and simple but elevated prose style of this translation, somewhat archaic from the outset, have permanently imbued the English language with gravitas and a rich stock of universally recognisable phrases. Thomas Babington Macaulay in 1828 called it "a book which, if everything else in our language should perish, would alone suffice to show the whole extent of its beauty and power" (McGrath, 301). This is a real 1611 Bible, and it is really selling for this price. And it will sell: this is the price range for these Bibles. If someone claims to be committed to the “Original King James,” this is what they are talking about, though it is most likely not what they carry to church under their arm.